Blackberries and chocolate have an affinity for each other, and red wine complements both. Poaching the berries is quick, and the brownies are almost as effortless. My sister and I have been making these brownies since we were kids, from my mom’s copy of the Busy Woman’s Cookbook (published in 1971 and written by the food editors of Farm Journal). They are probably too sweet for some people. Preheat oven to 350 degrees. Butter an 8-inch-square baking pan. Microwave the butter and chocolate together in a 2-cup Pyrex liquid measuring cup (or another glass bowl) just until they are melted. Stir to blend and set aside to cool to room temperature. Transfer the chocolate mixture to a medium-sized mixing bowl. Add the sugar, flour, baking powder, and vanilla extract. Using a rubber spatula, stir until all the ingredients are blended. Do not overmix. Mix in the eggs. Turn the brownie mixture into the greased pan. Bake for about 30 minutes, or until a toothpick inserted into the brownies comes out nearly clean. While the brownies cool, whip heavy whipping cream into soft peaks. Add powdered sugar to taste. 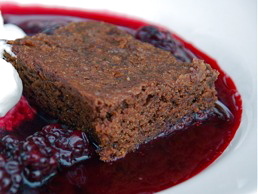 To serve, place a brownie square in a shallow bowl together with the berries, poaching syrup, and a dollop of whipped cream. This recipe comes from Kelly Myers' Front Burner column on cooking with summer fruits.